Union Pacific 2008 Dodge Magnum Crossing Accident Reduction Enforcement Unit (C.A.R.E.). Interior of Southern Pacific Railroad Police Caboose. Two Ford Crown Victoria (late 90s model) in front of Napa Valley Railroad Police Office (Caboose in background). Two Railroad Special Agents talking near a 1990s model Crown Victoria. Southern Pacific RailroadPolice Jeep Cherokeeassigned to Special Agent Toby Trevett in Avondale, Louisiana. Late 1980s Union Pacific Railroad Police vehicle, Isuzu Rodeo, driven by Special Agent Paul Miller in Avondale, Louisiana. Early 1900s Union Pacific Police vehicle, Ford Explorer, driven by Special Agent Paul Miller in Avondale, Louisiana..
Burlington Northern Santa Fe Railroad Police Vehicle. 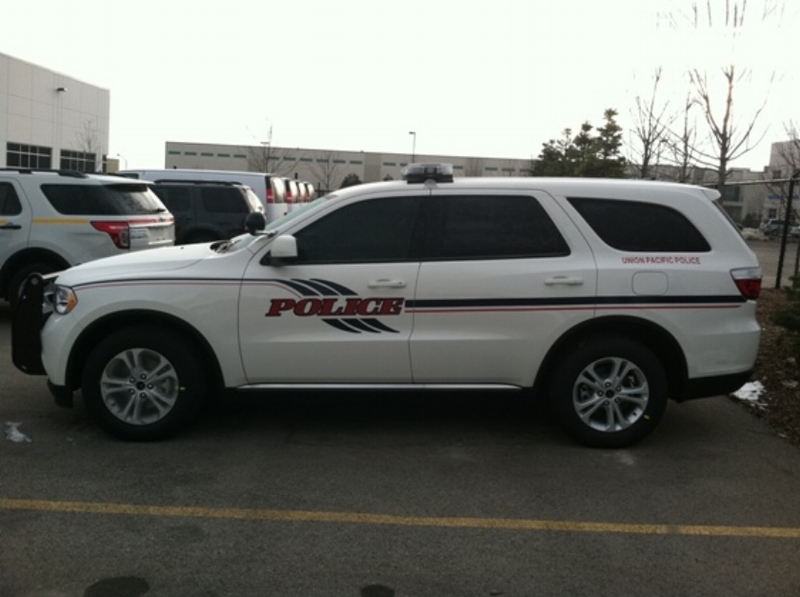 Canadian Pacific Railroad Police Service Dodge Dakota police unit. Norfolk & WesternBison Yard, Buffalo, New York. Special Agent Jerry Reinhardt standing next to his 1973 Ford, Custom 500. Norfolk Southern Railroad Police Special Agent Jerry Reinhardt standing next to his 1996 Chevy, Lumina. Unmarked Union Pacific Railroad Police 2005 Ford Explorer at Bailey Yard North Platte, NE. CSX Police 2008 FordExpedition with Accreditation sticker on upper vender. Left Terminal Railroad (TRRA) Police, on left Special Agent Jason Davis and on right Special Agent Nathan Branding. Terminal Railroad Police new acquired 2010 Ford Explorer with new police markings and TRRA engine with new paint scheme. In an attempt to combat crime along the rail, Southern Pacific converted several C-50-9 Class Cabooses with police badge and lettering. They were used to deter and catch people who were stealing from the trains (primarily for auto trains). Special Agents rode these cabooses along with the regular crew members. A Budd-built baggage-dorm car that was involved in a derailment in 1971 and later converted (1980s) for use by Southern Pacific Special Agents to watch auto loads on trains. Bay windows on the ends were installed and a 1 million candle power hand held spotlight was available for use by the agents. This car was fitted with showers, toilet, etc. Union Pacific Police 2008 Dodge Ram (Hemi Powered) K-9 Pickup and a 2006 Ford Explorer near a railyard in San Antonio, TX. Angled view of Union Pacific 2008 Doge Pickup K-9 Unit (same truck as above). Left: K-9 unit with current graphics. (Year model unknown, but look to be early 2000 models). BNSF and UP Railroad Police Units at a Parking lot in Alvin, TX during Hurricane Ike. Just the other side of the parking lot is a major line that UP and BNSF share with trackage rights.